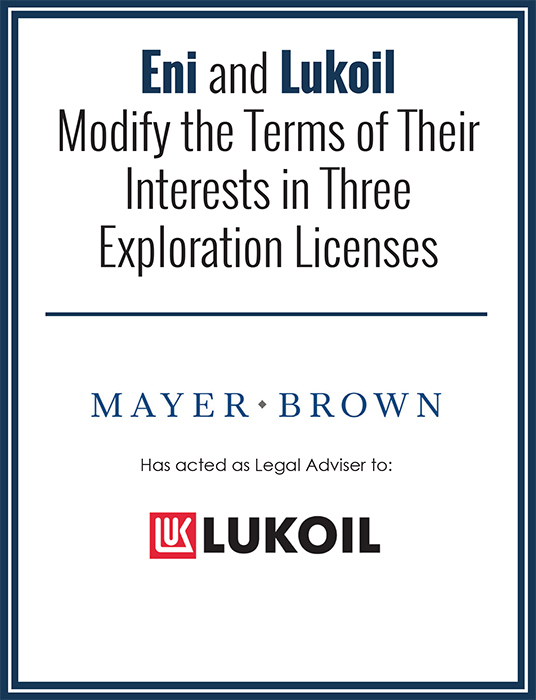 Eni and Lukoil have signed a farm-out agreement for the transfer of participating interests in three exploration licenses in Mexico’s shallow waters. According to the agreement, Eni will give Lukoil a 20% stake in the Production Sharing Contracts (PSC) in both Area 10 and Area 14, and will acquire a 40% stake in Lukoil’s PSC for Area 12. The objective of the deal, in light of the close proximity of the blocks, is to diversify the exploration risks, accessing wider opportunities and increasing mutual operational synergies. The new joint ventures will be as follows: Area 10 (Eni 80% operator, Lukoil 20%); Area 12 (Lukoil 60% operator, Eni 40%); Area 14 (Eni 40% operator, Citla 40% and Lukoil 20%). The agreement is subject to the approval by the Mexican authorities. The three blocks are all located in the prolific Sureste Basin and they were awarded to Eni and Lukoil in 2017 as the outcome of an international competitive bid round called “Ronda 2.1”, issued by the National Hydrocarbon Commission (CNH). The exploration drilling campaign is planned to start as early as mid-2019. Eni has been present in Mexico since 2006 and established its wholly-owned subsidiary Eni Mexico S. de R.L. de C.V. in 2015. After the approval of the swap agreement by the Mexican authorities, Eni will hold rights in seven exploration and production blocks all offshore: Area 1 (Eni 100%, operator), Area 7 (Eni 45%, op. ), Area 10 (Eni 80%, op. ), Area 12 (Eni 40%), Area 14 (Eni 40%, op. ), Area 24 (Eni 65%, op.) and Area 28 (Eni 75%, op.). In July 2018 CNH approved Eni’s Development Plan for the discoveries of Amoca, Miztón and Tecoalli, located in Area 1, which hold an estimated 2.1 billion barrels of oil equivalent in place (90% oil) in world-class reservoirs.